Get onboard - support your community by enrolling with your local Neighbourhood Alert - see below. Neighbourhood Alert is the newest, comprehensive, two-way system fully supported by national police forces. To quote from the local area website: Registration on the East Bassetlaw Neighbourhood Alert website will enable you to report information regarding any crime, suspicious behaviour and anti-social behaviour you see or hear within your area. Registration is restricted to residents of the East Bassetlaw area as well as people who work here. Action Fraud advice on bogus e-mails from apparently well-known companies, etc. 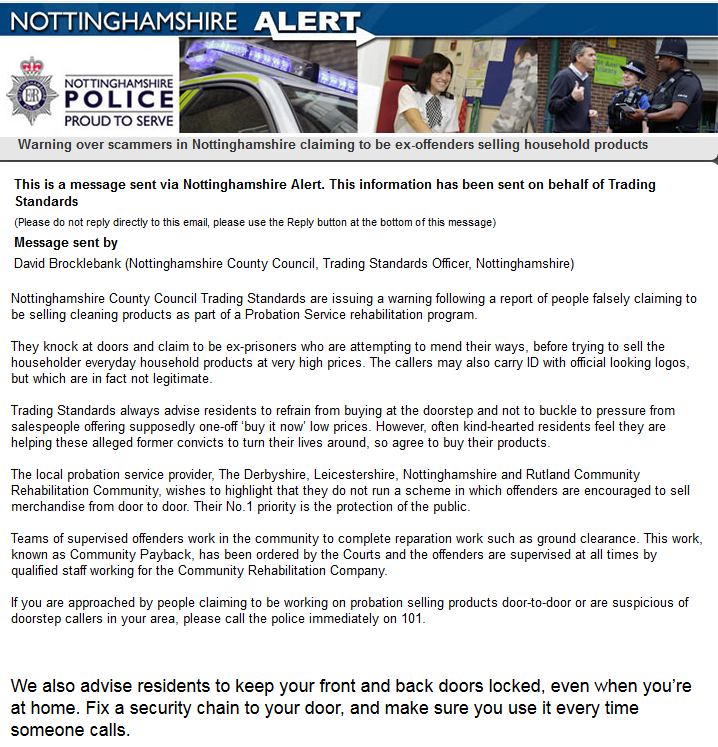 While this is a good warning, members of Clarborough & Welham IT Group will be aware of some simple checking procedures that we all use in this situation. Simply put; if you hover your pointer over a recently received e-mail - don’t click or move it for a few seconds - a box pops up containing the sender’s e-mail address. So, if it purports to come from (say) NatWest but the revealed sender’s address is not one that NatWest have given you on paper, then simply and promptly delete the message. Do not open (click on) doubtful messages and never click on any links within such e-mails. Remember, the Banking Code forbids banks and other financial institutions from contacting customers by e-mail (or phone) for anything to do with personal accounts. As our local PCSO Dave Airey has said on numerous occasions, ‘we are one team’, so please sign up to take an even more active part by opening the Neighbourhood Alert dialogue. Neighbourhood Alert are seeking the widest possible involvement by the local community; for more information and also to enrol please go to the East Bassetlaw Community Alert website. This really is a no-brainer if you want to be fully aware of what our police are dealing with, almost ‘as-it-happens’. This is only a selection - get enrolled for the full service! The visual quality of these screenshots are much lower than the actual Alerts due to our processes of transfer to this site. No ‘official’ body will ask for an ‘administration fee’ to ‘release’ something that they claim you are owed or have won. Such wording is an immediate warning that what follows is trying to extract money from you. Don’t ‘click’ on anything - just get out of there fast! No UK Bank, Building Society or reputable business will ever ask you to pass personal account details over via an e-mail. Again, this is a sure-fire warning that what you have received aims to be fraudulent. A quick way to check the origin of an e-mail is simply to ‘hover’ your pointer over that e-mail in your ‘in box’ - the e-mail address of the origin will then appear. Thus, a recent e-mail purporting to come from parcel delivery giant FedEx actually originated from e-mail address in Macau! Alerts are e-mailed to registered members at very regular intervals - highly recommended! ...no one knows your immediate area better than you, and now you have a facility with which you can be heard. In the past, many observations and pieces of intelligence from members of the public and concerned citizens have not been listened to. Many times as residents of the area, we have been aware of trouble brewing: gangs gathering and spoiling for trouble, con-men in the area, dodgy characters looking in car windows, people selling drugs, the list is endless. But, over the years, we have learnt that unless an incident is taking place at that moment, other issues take priority. The truth however is that the police intelligence department do want this information, they value it and have been fantastically supportive of the development of a system to collect this information confidentially. All reports made are stored safely and the local Safer Neighbourhood teams, Police intel units and your local co-ordinators are notified that information has been reported. When the authorised personnel log in and respond to your report you are notified by e-mail.